"The Face of Two Worlds"
New York City. A thief runs through an alley with a sack of loot, but is stopped by Michelangelo who tries to openly play superhero. After the thief faints, Leonardo tells Michelangelo that they’ll have a talk about his conduct later. Gotham City. Batman creeps into a two-tone tenement, fights off some henchmen and finds Two-Face absentmindedly watching televisions. 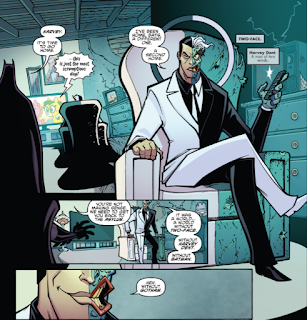 Batman asks Two-Face where all the Arkham inmates disappeared to, but Two-Face’s mind seems fractured. Two-Face draws a triangle and mentions something about two worlds before giving up without a struggle. New York. In the lair, Leo tries to lecture Mikey about keeping to the shadows, but Mikey just wants to be a superhero so bad. Donatello and April, meanwhile, pick up a reading on their sensors that a Kraang dimensional portal has been opened. 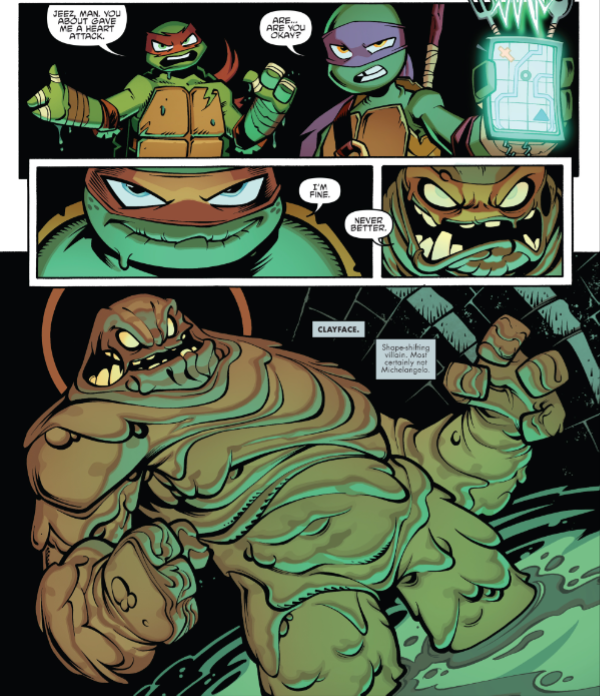 Mikey is surprised, since they recently defeated the Kraang for good, but the Turtles have no choice but to investigate. Arkham Asylum. Batman investigates the empty cells and in each of them he finds a triangle pattern on the wall. He takes a scraping before Security Office Aaron Cash walks by, having just locked Two-Face back up. The sewers. The Turtles and April follow the signal to an open Kraang portal (triangle-shaped). Mikey is suddenly attacked from below the water and is pulled down. He resurfaces and everyone relaxes, at least until he transforms into Clayface! 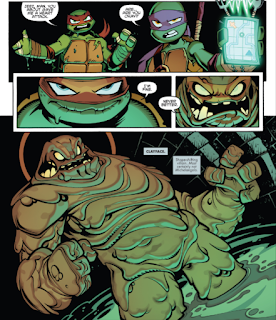 Clayface pummels the Turtles until Mikey shows back up and distracts him with name-calling. That gives Donnie time to blast Clayface with water from a drainage pipe, the force sending him back through the portal. The portal then closes and the Turtles are left with lots of questions. The Batcave. Batman looks over the list of missing Arkham inmates (the Joker, Harley Quinn, Scarecrow, Mad Hatter, Clayface, Poison Ivy) while analyzing the energy residue he scraped off. The source appears to be otherworldly, but he was able to program the Batcomputer to alert him to any energy spikes similar to the one that happened before the inmates escaped. The alarm goes off and Batman rushes to the Batmobile, telling Alfred to call Robin. Chinatown. A unit of Footbots investigate an alley and find several of their robot kin dismantled. 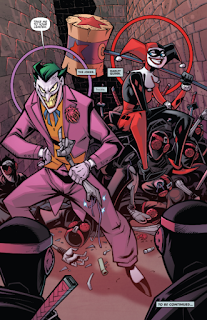 They’re greeted by the Joker and Harley Quinn, who are new in town and wish to be taken “to their leader”. *This Nickelodeon-based TMNT miniseries was preceded by TMNT Amazing Adventures #14. 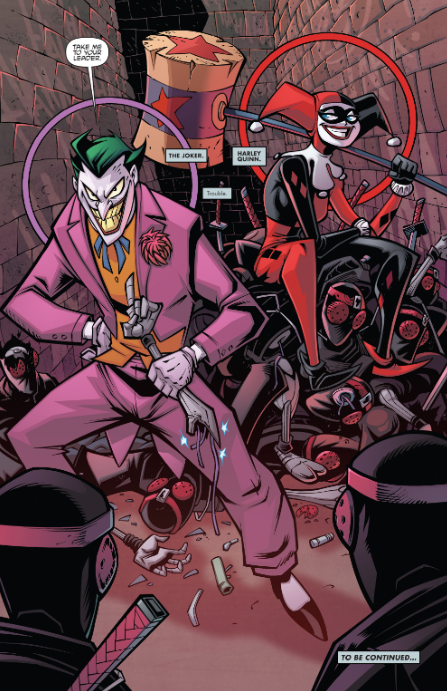 The story continues in Batman/TMNT Adventures #2. *In February, 2017, a Director's Cut edition of this issue was released by IDW. 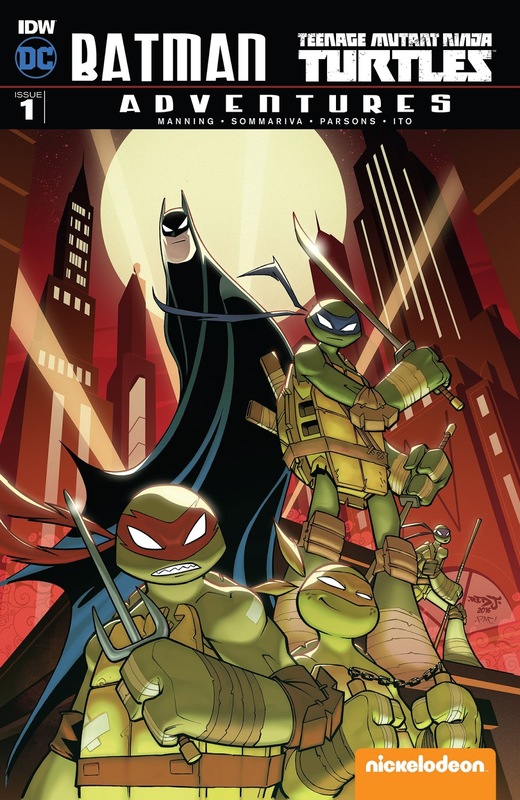 *Although the previous Batman/TMNT miniseries featured versions of the characters “inspired by” the New 52 Batman and IDW TMNT, this miniseries features the Batman: The Animated Series and 2012 Nickelodeon TMNT cartoon versions of the characters. *In an interview, Manning and Somariva explained that from Batman's POV, the series takes place between Batman: The Animated Series and The New Batman Adventures. For the Turtles, it takes place before they went into outer space at the start of season 4. *However, that placement creates a continuity error regarding the presence of Clayface. He was disincorporated in the Batman: The Animated Series episode "Mudslide" and was not restored until The New Batman Adventures episode "Growing Pains". He did appear in an earlier New Batman Adventures episode, "Holiday Knights", but that one was broadcast out of order. *The show Two-Face is watching is “Pretty Pretty Pegasus”, a cartoon series featured in Teen Titans Go! (and obviously a spoof on My Little Pony). *The Turtles defeated the Kraang (seemingly for good) in the season 3 episode "Battle for New York". *Aaron Cash originated from the mainstream Batman comics, specifically the Arkham Asylum: Living Hell miniseries. He’s more famous for appearing in the Batman: Arkham Asylum video game. He never actually appeared in the Batman: The Animated Series cartoon (as its run predates his existence). *This issue was originally published with 21 variant covers. Get ready for a big block of text: Regular Cover by Sommariva, Subscription cover by Kevin Eastman and Tomi Varga, Subscription Cover by Ciro Nieli, Sketch Cover, Incentive Cover by Hilary Barta and Jason Millet, Incentive Cover by Ty Templeton, Amazing Fatasy/Bishart.net Exclusive by Ben Bishop, Anastasia Exclusive by Alex Kotkin (2 versions), Dynamic Forces Exclusive by Ken Haeser (2 versions), Coast City Comics Exclusive by Steve Lavigne, Peter Laird and Ben Bishop, Fried Pie Exclusive by Tony Fleecs, Nerd Block Exclusive by J. Bone Zing EB Games Exclusive by Ben Bishop, New England Comics Exclusive by Ian Nichols, Yesteryear Exclusive by Dario Brizuela (3 versions), Heroes & Fantasies Exclusive by Eddie Nunez, and Knowhere Comics & Games Exclusive by Derek Fridolfs and Heather Breckel. Hey, we’ve got another Batman/TMNT miniseries on our hands. Rather than go with a sequel to the previous one, IDW and DC opted to team up two DIFFERENT incarnations of the characters for a new "first" encounter. My hopes are that we don’t retread too much ground from the first miniseries, as now the characters will have to meet each other “for the first time” all over again. We’ve already witnessed a bit of rehashing in this first issue alone, as the Turtles encounter one of Batman’s second string villains in the sewers and defeat him handily. They did that in Batman/TMNT #1, albeit their opponent was Killer Croc, not Clayface. It’s a good warmup act, but you might be feeling some deja vu. Such reservations aside, I loved Batman: The Animated Series back when it first aired and it’s one of those rare cartoons from my childhood that has aged gracefully to the point of being just as enjoyable now as it was then. So this is an incarnation of Batman that I’m much more familiar with (I hadn’t read enough of the New 52 era to really call myself an expert on that Batman). Manning gets the beats and voices of the characters down nicely, from Alfred’s goofing on his master to Batman’s coddling of Two-Face (his strained friendship with Harvey Dent being an angle The Animated Series regularly played up). Sommariva’s pencils have a very elastic look about them and the characters do appear extremely animated. I’ll confess that Chad Thomas was my favorite penciller from IDW’s Nick-based TMNT comics, but Sommariva was never far behind. His style is very expressive and the characters stay on-model between their various universes. Batman looks like he stepped out of his cartoon and the Turtles look like they stepped out of theirs. The aesthetics don’t clash as much as you’d think. He does resort to some cheap time-savers that aren’t so appealing, though. He draws characters that are prominently in the midground as crudely as if they were specs in the background. Oftentimes there isn’t that much distance between a detailed character standing in the foreground and a vaguely shaped color blob in the midground, yet the disparity in effort would have you believe that they’re miles apart. He also does the ole “cut and paste the same art between multiple panels, but only change one figure” trick that I’ve never liked. C’mon, artists of the world. You’re better than that. 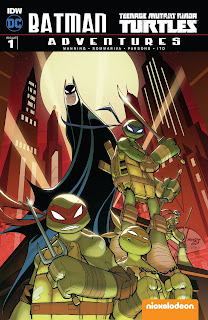 While we’re perhaps tempered to the expectation of diminishing returns (this is the second Batman/TMNT crossover; not as exciting as a first), there’s still plenty of potential for fun in seeing these cartoon versions of the characters interact. We’ve already hit some rerun moments from the first miniseries, but hopefully that won’t be too frequent an encounter. Not much else to say, ATM, as Mark said it all, anyway. Good review, as always. Thanks for the link! I'll update the Turtle Tips. I can't help but feel that The 2012 TMNT series is basically a Member Berry from South Park they remind you stuff from the 90s and 80s.